What will EfW look like after Brexit? 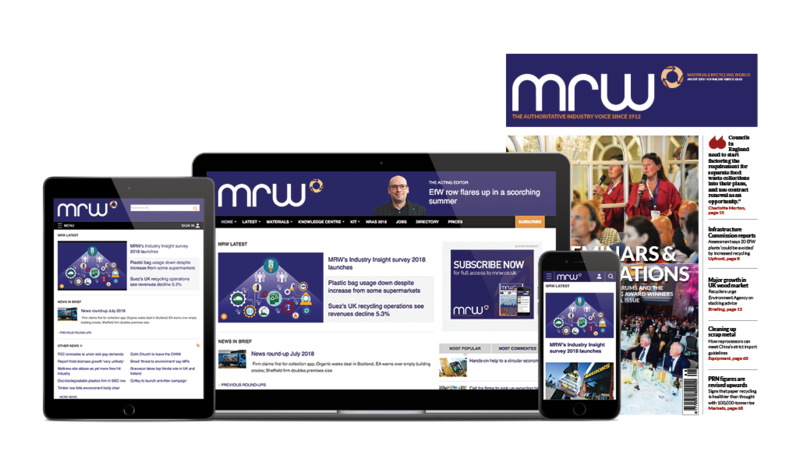 This subscription package is aimed at professionals that wants to access to critical recycling and waste management insight, latest news and valuable industry insight. Comedian and actor Eddie Izzard will star in seven radio ads for this year's RecycleNow campaign. Delivered in Izzard's typically frantic and surreal style, the adverts focus on five different materials, as well as one that highlights council collections and another that covers recycling in general. The glass advert features Izzard saying: "If you are eating pickles out of a jar then stop - take the pickles out, and then you get the jar and you recycle it and then it will come back as another jar and you can put the pickles back in it, so that it is a pickle jar, or a jar of pickled Martians." "RecycleNow.com, the possibilities are endless." The 20-second adverts will be played on local radio across England, accompanying a national TV advertising campaign this summer. They follow last year's successful ads, also voiced by Izzard, which by the campaign's conclusion had seen the target audience view the TV ad for can recycling an average 14.3 times. RecycleNow is run by the Waste and Resources Action Programme (WRAP) and WRAP director of communications and awareness Gareth Lloyd said: "The messages we wanted to get across in this year's campaign was that recycling is easy, everybody's doing it, there's value in it and there's a local benefit." Commenting on Izzard's support of the campaign, Lloyd added: "Eddie Izzard won't do adverts for commercial brands. "We see this as a big plus, because when celebrities start appearing all over the place on toothpaste ads and whatever else, then people pay less attention to the voice." A septuagenarian has been fined for unlawful dumping and burning of waste. Shropshire Council is facing opposition to its decision to close 120 Veolia recycling bring banks in a bid to save £237,000 a year. DS Smith has warned that the UK’s current recycling infrastructure will not be able to deal with an increase in packaging from online sales, and there is a risk the 2035 recycling target will be missed. Scotland’s recycling rate for materials from all sources in 2017 was 58.9%, Scottish Environmental Protection Agency (Sepa) statistics have shown, a slight decrease against 2016. With a focus on the recycling and waste management sector, in particular, materials processing and reprocessing, waste management and collection, retail waste and recycling, construction waste and recycling, MRW is read by key decision makers in the industry.